A new G Guardian for Chronojet dedicated Decks is revealed from “TRY3 NEXT”! Auto: [Choose a total of 2 “Chronojet” cards with different names from the hand and Drop Zone respectively, reveal it, place them on the bottom of your Deck in any order in any order] When this Unit is placed on (GC), you can pay the cost. If you pay it, during that battle, this Unit gains [Shield]+15000. For Today’s Card, we’re introducing a 《Gear Chronicle》 G Guardian, “Highbrow Steam, Alrim”, from the Character Booster “TRY3 NEXT” (on sale December 9th, 2016), that supports Chronojet centric Decks that use both “Chronojet Dragon” and “Chronojet Dragon G”. 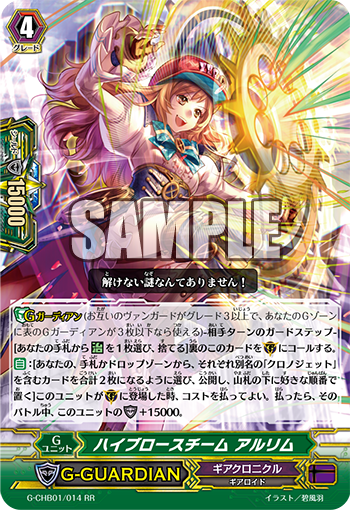 “Highbrow Steam, Alrim” has a menacing ability that lets it gain Shield+15000 if you return 2 different “Chronojet” cards from your hand and Drop Zone to the Deck! With an essentially 30000 Shield, you can deflect the vast majority attacks, and since it doesn’t use Counter Blast or Soul Blast, it’s a super-easy to use card. Also since it returns “Chronojet” back to the Deck, you can reuse them with card effects that Call. Use this card or “Retroactive Time Maiden, Uluru” depending on the situation, such as the Power of the attack involved or whether or not you have cards to return to the Deck. The Character Booster “TRY3 NEXT” has plenty of different cards that support the 2 different Chronojets. And today, “Weekly Vanguard News Bits NEXT” introduces a 《Gear Chronicle》 ace card. So keep your eye out for this information.